Radical Congresswoman Ilhan Omar was booed by a pro-American crowd as she arrived at a fundraising event for terror-tied CAIR on Saturday evening. CAIR, an unindicted co-conspirator in the largest terrorist funding case in U.S. history, has been aggressively lobbying to censor any American who dares speak out against radical Islam. Thegatewaypundit.com reports: Recently CAIR lobbied to have Jewish conservative activist Laura Loomer deplatformed from Twitter. Judge Jeanine Pirro was suspended from her FOX News show after she questioned if Ilhan Omar’s allegiance was to Sharia law given she wears a Sharia compliant hijab. Conservative street artist Sabo savaged CAIR and Ilhan Omar with anti-Sharia law posters ahead of Omar’s speaking event. 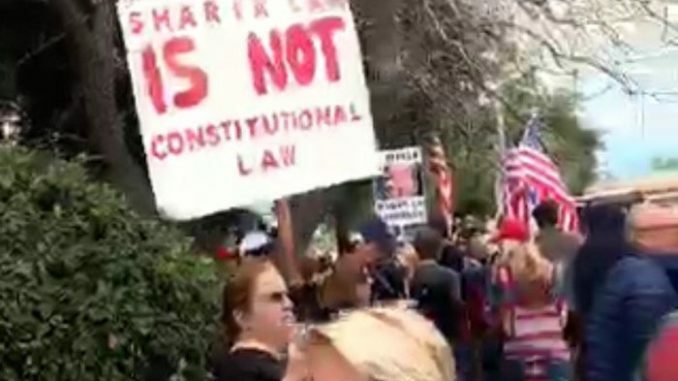 Trump-supporting, anti-Sharia law Americans showed up to the Hilton Hotel in Woodland Hills Saturday night to protest Ilhan Omar and CAIR. Hilton Hotel guests took part in the Pro-American and Pro-Israel rally against Ilhan Omar and CAIR in Woodland Hills, California. Laura Loomer and Jacob Wohl are outside of the Hilton Hotel.